Q.C. Systems introduces the new KURTSmart PROBE designed as a simple method to verify part measurement accurately and economically in quality control processes. Combining the advantages of an LVDT with the accuracy of a linear scale at a fraction of the cost, KURTSmart PROBE is a new generation of pencil probes from Kurt providing two types of actuation - spring extend and pneumatic extend - for modern gauging requirements. The KURTSmart PROBE offers the easiest way to plug and gauge, featuring an LVDT pencil probe design that outputs a linear value over the entire stroke of the probe. The probe requires just 5 volt power for measurement and can run standalone, measuring and sorting parts based on feature size very quickly. An onboard input and output port supports the triggering of the measurement and action to be taken based on the measurement result. The KURTSmart PROBE can provide a measurement result without being connected to a computer. A set of five small LEDs provided on each side of the probe will visually show the operator if a part is good (green), trending bad (yellow) or bad (red). The KURTSmart PROBE can also be used in computer stations or other devices that support a USB interface to provide complete and accurate measurement results to computer based data collection systems. Probe results can be mixed to provide complex GD&T data results. 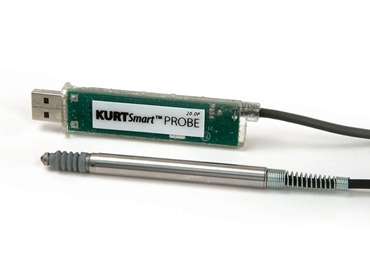 KURTSmart PROBE pencil probes are factory calibrated over the entire working range of the probe allowing user programming for any specific operation range using the free KURTSmart PROBE configuration software. Key features include 14 bit precision accurate to 12 bits; pre-calibrated status ensuring all devices measure identically over the full stroke; onboard dynamic scans (MAX, MIN, TIR, AVG); LED indicators with programmable scale to fit a tolerance range; indicators visible from top or side mounted on both sides; onboard I/O for standalone operation; nameable for consistent identification by the software; USB to COM port interface; and compatibility with standard USB hubs allowing multiple probes per system. LVDT stroke lengths include 2.0mm, 5.0mm, 10.0mm, 20mm spring and pneumatic extend models. The KURTSmart PROBE is part of a complete line of precision custom gauging systems, SPC software and data collection technology available from Kurt Engineered Systems. Kurt’s precision gauge systems range from simple benchtop stations to multi-featured measuring machines to fit customer specifications.